Having passed my driving test back in July 2005, this was to be one of my first trips by myself in the car to the middle of Glasgow. As expected, I came off the Motorway too early, and ended up going past Buchanan Street Bus Station and straight through the middle of Glasgow instead of round the outside! I was so glad to arrive safely… eventually! Stirling Juggling Project old and new meet! Most of us set up our base in a corner of the downstairs hall. 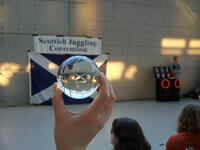 At this convention, I mainly practiced and improved my 5 ball juggling (which I couldn’t even do at this time last year), and also my 3 ball in each hand (I can get approx 30 catches in either hand). I decided to practice toothbrush twirling, so that I could gather an audience and meet new people, and 4 people joined in! I then did another workshop for Beach Flingo which went down well! Most people haven’t seen either props being used before, so it has a novelty factor! John Newton taught 4 of us how to use this prop. We did it outside as it definitely needs a lot of open space to practice! I was amazed at the crowds of Rangers supporters en route to Ibrox Stadium who walked either through the workshop or right beside us when we were throwing these large and heavy objects into the air! Graham Benson gave some tips on the art of heckling and how to deal with hecklers. I am so glad that Circus Kevin ventured up to this Convention, as he puts on the most appropriate workshops which are inspirational! This workshop could have easily filled a 4-5hr timeslot, but was kept to around an hour. Amongst the crowd of listeners in the workshop, there were quite a few people who do Schools Shows (Doc, Max Marshall and myself) as well as Ruth, and we were all able to chuck in ideaâ€™s to compliment what Circus Kev taught us. It was acknowledged that there needs to be more openness among us performers to help give ideas and inspiration to each other and improve all our shows, and this is one thing that the Aberdeen Street Entertainers Convention will address in their day long convention in October. The stage was huge for the first 2 Unicycle acts, which were excellent and well choreographed. Scott C filled in between the 2 Unicycle acts to allow Hella time to change costume. His magic routine involved catching a bullet in his mouth. Another well choreographed piece. We were all then invited to move our seats much nearer the front of the atrium for the rest of the show. T his was the point in the show where the sound system broke! The song was “singing in the rain”, but it was the up-tempo version that recently featured in a car advert. We all joined in and provided the musical background to his act, and the sound system eventually kicked in! 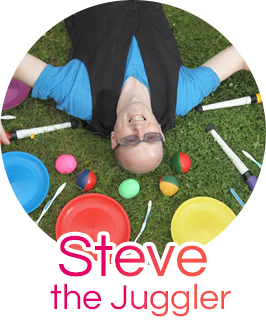 Excellent 1 and 2 diabolo routine from this gentleman juggler. Ian and Val of Edinburgh Performers – they were excellent and funny. They managed to improvise extremely well when the sound system broke down! Norby’s ring routine was good. He did it wearing a dress! John Newton and his stunt double George! Always good to see the wonderful George the Juggler in action! John Newton’s flag throwing is always impressive, and this year he added a bit of comedy and interaction with the audience which was received very well. Excellent singing voice. The Scottish song was about throwing bread out of a 20 storey flat, and how it will never hit the ground! Tempei was by far the best act on the show, and he was excellent and inspirational to watch at any time during the convention. His renegade on the Saturday night was even better than his public show! 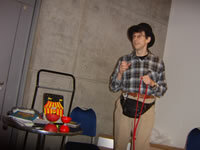 The yo-yo dude who stole the show at the British Juggling Convention! He did one new act, then his choreographed routine to Grease Megamix, and he went down a storm once again! He laid his props out on my workshop suitcase before he began the show! Excellent finale, and good comedy juggling. Great technical ability, and very endearing to the audience who warmed to him instantly. Ruth (Azrelle) had to pull out from the show, otherwise I am sure she would have got a fantastic write up from me for the 5th year running! The best public show yet! Certainly the highest profile names compared to previous years. Tempei and Ivan Pecel were awesome and highly entertaining, and the overall standard was much better than last years public show. There was a Te-Pooka Fire Show immediately afterwards. It was very cold outside and I hadn’t brought warm clothing, so I must admit to spending most of my time feeling very cold and not concentrating! They had a spectacular finale where Meg did some staff spinning with 2 fireworks attached to the staff. Awesome and original stuff! Emma and James had never really Ceilidh danced before, so myself and Amber partnered them for a couple of dances. The large hall was very hot, and after each dance, we had to cool off! It was a great Ceilidh and the band were excellent. During an 8 person dance, we were joined by a 9th person who just wanted to take part in the dance. She seemed a little annoyed that we were ignoring her and trying our best to keep to our formation though! Ruth (Azrelle) hosted. I had planned on being the opening act, and had my props all laid out, but my Songs Mix Routine is on tape, and there didn’t seem to be a tape player in the entire building! This was the low point of my convention, as I had looked forward to doing this well rehearsed routine for many months. George’s best bits (he is a legend) where he recreated the best moments of some of his top shows over the past decade. Tempei was even more awesome doing an unrehearsed 10-15min slot than during his amazing public show! Tom’s contact juggling was excellent. I am improving with my 3 haggis juggling each year, and this time, I was down to the last 2 people standing, but after approx 6mins 30 (just under halfway to the world record) I dropped! The winner dropped about 20 seconds later! The raffle took place during the 3 haggis juggle, and my number was the third out the hat, but I couldn’t claim my prize! Graham Benson asked me if I wanted to host the Juggling Games, but I turned him down as I wanted to win most of the events! We did all the usual games, plus a few new ones (mainly involving the teaspoon convention pass!) I won the stredging with Jonny for the third year running, and I also won the 4 scarf endurance competition. I won a couple other games, but I can’t remember which ones, I just remember winning lots of sweets each time and sharing them with different groups of friends! Jonny and I set off after the toss-up at the end of the games. It was a more straightforward journey, although at one point, I began heading down a one way street the wrong way! My driving will improve for the next Scottish though! Rachels plane had overshot the runway at Luton, and the airport had been put on terrorist alert, so I didn’t need to go and pick her up as she was going to have to stay overnight and get a flight home on the Monday instead, so I headed back to Stirling and went to the evening service at Stirling Baptist Church, falling asleep in the back pew until someone woke me for communion! Another great convention. Thanks to Graham and Britta (and any other organisers) I njoy the Scottish more each year, and there’s more people I can encourage to come along who are in some way connected with Stirling Juggling Project, and there is usually a slight increase in numbers back at our club each Wednesday following on from the Scottish! I am looking forward to next years “Scottish” already! Hopefully it will be in the same locations again. Hard to see how they can improve the excellent public show, but I am sure they will manage it, and I may even get to do my renegade act next year if I bring a tape player!